In the 2nd instalment of Acid 909 we are proud to present from UK’s biggest Acid techno record label Stay Up Forever and his own label Braingravy the fantastic Steve Mills. 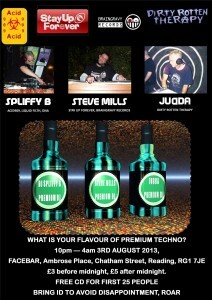 DJ STEVE MILLS – Started DJing back in 1996 and was soon banging out tunes on Force FM. He was then spotted playing out by a local sound system and became part of the crew R.P.M. After many years he became a resident for the HUB Sound System, and still rocks it for HUB when possible. He has since played for many sound systems and lots of clubs. He was the only DJ to play Acid Techno on the FM dial for over a decade, and has been lucky enough to represent Stay Up Forever (Stay Up Forever Broadcast Party) and play alongside, Chris, Aaron, and Julian Liberator, D.A.V.E The Drummer, Sterling Moss, Ant, Geezer, D.D.R, Rackitt, K.N, plus many more. He had great success with many releases working with London legends D.A.V.E The Drummer, Chris Liberator & Sterling Moss as well as solo releases which appear on Wah Wah, Sythe Squadron, Extreme Forces, Soitiz, Flatlife Records, Stay Up Forever Projects, Stay Up Forever, & Braingravy Records!! He is also part of the Monster trio “303 Pirates” with partners Chris Liberator & D.A.V.E The Drummer He has had Great international success in countries like Brazil, Poland, Germany, Netherlands, Ireland & Prague playing at events like Acid Techno Pioneers, HardRace Underground 5 & the Amazing SoundFeer music Festival, plus more to come in the UK & Abroad. He has also been described as one of the most killer acid techno DJ’s out there !!! Due to unforeseen circumstances Judda wont be able to make this event, so contrary to what is advertised we are pleased to announce one of the best DJs in the London Squat and club scene Miro ( https://soundcloud.com/mirohardparty ) from HARD PARTY PRODUCTION sound systemAs always Spliffy B will be gracing the decks with harder edged Acid and gabba. Spliffy B started DJing at squat parties in 2000 around Dorset and Hampshire. He then started playing in clubs in 2002. Between 2002 and 2008 Spliffy was playing in various places mainly in squat parties around UK. In that time he did play a few sets in Germany, and Belgium. In 2004 Spliffy B amongst other events he was promoting he promoted DNA with DJ Slimz. Between 2008 and 2011 due to personal reasons he only played a few sets, one of which was on Weymouth Beach. In 2011 NYE he played a set in Holland. 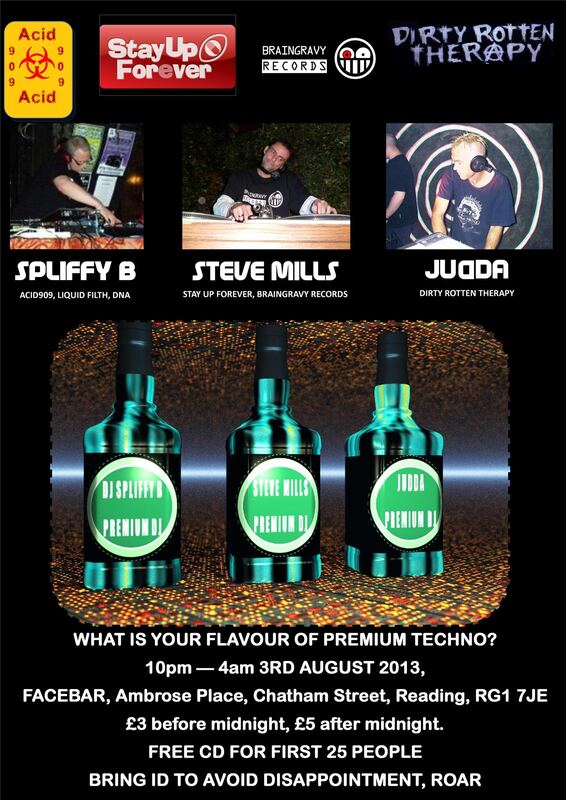 Since then Spliffy B has started promoting an DJing again. Spliffy B is currently a resident of yes yes y’all which is Readings premier UK hip hop event. He also promoted and played at liquid filth in august 2012 with Slimz, DJ Fiber and MiNoR cOnFuSiOn. Spliffy B has supported several big name DJs. Due to the closure of Readings premier drum n bass venue Liquid Filth is now looking to relocate (So watch this space!!!). Spliffy B has never classed himself as technically good, but has always put together killer track listings. He is known for going very industrial. 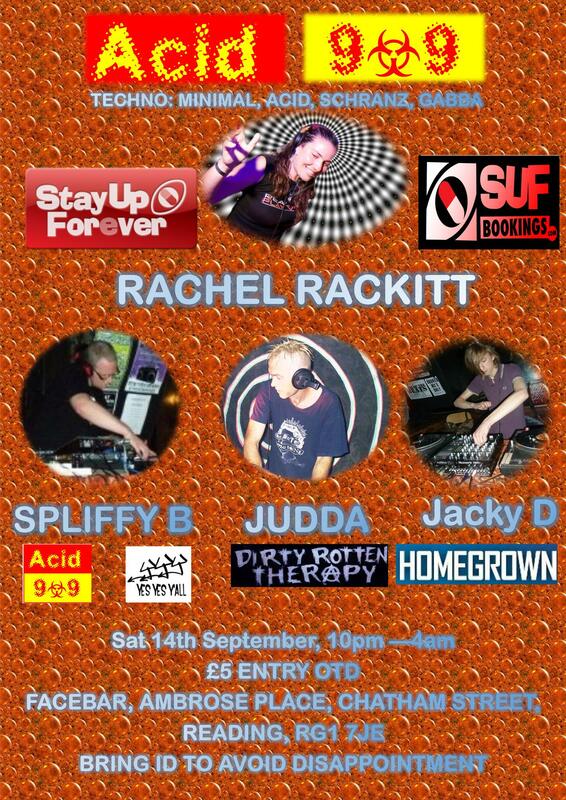 This is looking to be a fantastic event of nasty acid lines, stompy beats and industrial tempos. If you love your techno this really is not to be missed!